Paper receipts seem so innocuous, but they’re becoming an environmental nightmare. Why? Because these shiny smooth pieces of paper are made of thermal paper that uses heat rather than ink to form letters and numbers. and it relies on bisphenol A to do so. If you scratch a receipt and see a dark line, then you know it contains BPA or its common substitute BPS. BPA is a hormone disruptor and is absorbed through the skin, which means that even reaching for a receipt poses a risk of contamination. To make matters worse thermal paper cannot be recycled. Its only “safe” destination is the landfill. What to do? Be selective about the receipts you accept. Only take those you need in order to return an item or claim it as a business expense. Otherwise, just say no. Leave the receipt at the store. If you work in a store and handle these receipts daily, best to wear gloves to avoid absorbing the BPA which invariably gets absorbed through your skin. It’s not a problem that’s going to be solved overnight, but it is something I suspect we’re going to start hearing more about. Democracy Now, Sept. 4, 2018. Data from the largest-ever animal study of cellphone radiation effects, released last month by the federal National Toxicology Program, confirms earlier evidence from human studies that cellphone radiation increases the risk of cancer. The developing brains of children and teenagers are especially at risk because their brains can absorb twice as much cellphone radiation as those of adults. Headsets emit much less radiation than phones. Choose either wired or wireless. Using your phone in speaker mode also reduces radiation to the head. The amount of radiation absorbed by your body decreases dramatically with even a small distance. Texting keeps radiation away from your head. Radiation exposure increases dramatically when cellphone signals are weak. Health agencies in at least six countries are recommending limits for children’s phone use, such as for emergencies only. Glitter used in everyday cosmetics, specialty make-up, hair products and party paraphernalia has negative effects on human health and the environment. They get into everything, and despite their tiny size, can have a devastating impact on humans and animals. Why? Glitter is one member of a large family of microplastics-- little bits of plastic less than five millimeters in size. Think microbeads, microfibers and fingernail-sized fragments of much larger plastic wastes that have broken down over time. When washed or flushed away, microplastics make their way into oceans and lakes, slowly accumulating over time, creating all sorts of health and environmental hazards. For one, there's the issue of how microplastics like cosmetic glitter—made by bonding aluminum with polyethylene terephthalate (or PET)—impact sensitive ecosystems. That's because PETs leach out endocrine-disrupting chemicals, which, when eaten by marine life, can cause adverse developmental, reproductive, neurological and immune effects. Then there's the domino-like effect of microplastics through the food-chain, for the sheer volume of microplastics consumed by seafood-loving humans is staggering. One study found that Europeans who eat shellfish can consume as much as 11,000 microplastics per year. But that’s not all. PETs attract and absorb persistent organic pollutants and pathogens, adding an extra layer of contamination. A growing body of research connects endocrine disrupting chemicals with the collapse of marine and freshwater fish populations, as well as the decline in male births in humans living adjacent to plastic factories. So vote with your wallet. Avoid glitter, as well as other microplastics. Indeed, avoid plastics altogether as much as you can. The new cup is made with paperboard certified to the Sustainable Forestry Initiative Standard. The cups will be introduced at all Dunkin’ Donuts restaurants in New York City and California in spring 2018, and will be phased in across the U.S. as supplier manufacturing capabilities ramp up. When Shopping for a Bicycle, Get a Gender-Neutral One. It’s Safer. A Dutch safety organization believes bicycles with top tubes (or crossbars) should be be banned. These are what is known as “men’s bikes.” According to a Swedish study, women’s bikes are safer because cyclists assume a better posture while riding them and they have a lesser chance of getting a serious head injury when they’re involved in traffic accidents. Men’s bikes with crossbars are especially dangerous for older riders. As people get older getting on and off the bike isn’t as easy. It’s the moment when most accidents occur, especially on e-bikes, and the consequences of a fall can be very serious for older people. According to the study, the safest bicycle is a Dutch-style bike, with its “sit up” style. They are sturdy, comfortable, low maintenance, practical, pragmatic, stylish, and heavy. Gender-neutral bikes are the future we should be focusing on. A judge has ruled that the state of California can require Monsanto to label its popular weed killer Roundup as a possible cancer threat, despite insistence from Monsanto that the herbicide poses no risk to people. The problem is glyphosate, the active ingredient used as a broad spectrum post-emergent herbicide used to kill annual broadleaf weeds and grasses. Roundup is sold in more than 160 countries. California farmers use it on 250 types of crops. Is it toxic? Of course it is. It’s designed to kill living cells. That’s what the suffix “cide” means—to kill. But at what dose is it harmful to humans? That’s the question that has yet to be definitively determined. Nevertheless, the ruling is certain to harm sales of the product. California would be the first state to order such labeling. Once a chemical is added to a list of probable carcinogens, the manufacturer has a year before it must attach the label. Glyphosate, the main ingredient in the pesticide Roundup, is much in the news lately. It was well on its way to being banned before Trump's team nixed the idea, allowing the chemical to be sprayed on agricultural crops and sold in garden centers without a warning as to its probable carcinogenic effects. It's buyer beware in the marketplace today. Stay informed. 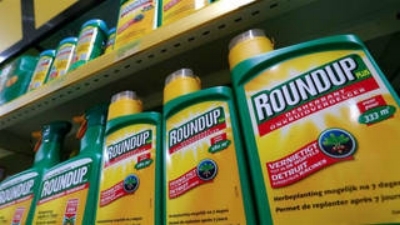 Crying "It's bad for business," Monsanto (the maker of glyphosate) has joined with farmers to stop the state of California from issuing a warning label on products containing the chemical, like Roundup, the most popularly used herbicide in the United States. Scott Pruitt’s EPA has rule in Monsanto’s favor on glyphosate—the key ingredient in Roundup, the top-selling weed killer. This ruling contradicts the World Health Organization, which classified the pesticide as a probable carcinogen. In addition, a group of Big Ag lobbyists, backed by Monsanto, has taken action to stop California from labeling Monsanto’s Roundup a carcinogen. In early 2017, Pruitt reversed the scheduled ban of the neurotoxic pesticide chlorpyrifos after meeting with its manufacturer, Dow Chemical. I’ve been following the controversy surrounding glyphosate, the main ingredient in popular weed-killers, including the herbicide Roundup. I’ve got to admit, this scares me. According to studies by the World Health Organization, glyphosate is a probable carcinogen, but the U.S. EPA refuses to label it as such. For more than 40 years, farmers have applied glyphosate to crops, most recently as they have cultivated genetically modified corn and soybeans. According to the Department of Agriculture, in 2014 approximately 240 million pounds of glyphosate were sprayed in the U.S. As a result, glyphosate now contaminates air, water, and soil across a vast expanse of the country and shows up in the food Americans eat every day. The EPA’s 2012 assessment of glyphosate estimated that American adults could be ingesting more than 5 milligrams of glyphosate every day – five times more than California's proposed limit and 500 times more than the Environmental Working Group recommends. It's unknown how much glyphosate is in Americans' bodies, because federal agencies responsible for pesticide safety have neither tested nor mandated testing for glyphosate in food, drinking water, or bodily fluids. Biomonitoring studies found glyphosate in the bodies of children and pregnant women. According to initial data, women who were more heavily exposed to glyphosate during pregnancy were more likely to give birth to premature babies that weighed less than average. Biomonitoring studies of adults and children in agricultural and non-agricultural areas consistently find glyphosate in urine, indicating that glyphosate from food is absorbed into the body. Farmers and rural families have two to three times more glyphosate in their bodies compared to those in non-farming families. All the more reason to eat organic food. It's buyer beware in the marketplace today. Stay informed. Last week a U.S. judge ruled in Monsanto’s favor and blocked California from requiring Monsanto to label the pesticide glyphosate as a carcinogen. This ruling dismisses findings from the International Agency for Research on Cancer that the pesticide is a probable carcinogen. Glyphosate, the main ingredient in Monsanto’s Roundup, remains on the state’s list of chemicals known to cause cancer, but consumers won’t be warned about the risks if this ruling stands. Cancer victims and their families have filed more than 300 lawsuits against Monsanto, claiming that Monsanto knew about glyphosate’s cancer risk and failed to warn them. The anti-plastic movement is gaining momentum worldwide. Many countries and cities around the globe are taking steps to eliminate plastic straws, and plan to ban all single-use plastics eventually, too. 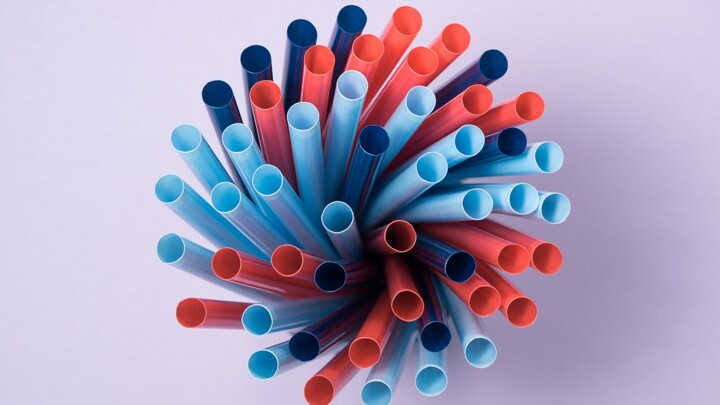 Scotland plans to be rid of plastic straws entirely by 2019, and Taiwan plans to ban single=use straws, cups, and containers nation-wide by 2030. Canada has shown similar support with Vancouver voting to ban plastic straws, foam cups, and foam takeout containers by June 2019. Single-use items like plastic straws, cups, containers and stir sticks are used once and then tossed away. In some cases, plastic straws can be recycled, but more often than not they end up in landfills or pollute our oceans. One million seabirds and 100,000 marine animals die from ingesting plastic each year. Since it can take up to 200 years for a plastic straw to degrade, this builds up at an exponential rate. While plastic pollution is not due to straws alone, banning straws is a good first step towards cleaner oceans and single-use plastic elimination. The clothing brand Patagonia has long been at the forefront of environmental commitment. For years, they’ve been hosting pop-up events where customers can bring used clothing items for repair or exchange. These events have been so successful, the brand has now launched a permanent website, called Worn Wear, where you can trade, sell, and buy second-hand Patagonia goods--the brand's own thrift store. Worn Wear works like this. You buy clothing, either used or new, from Patagonia and wear it till you're done, then trade it in at a local Patagonia store. Staff will tell you how much it's worth, and do the washing, too. There are standard trade-in values listed at wornwear.patagonia.com. Patagonia says they will pay up to 50% of the price they will sell the item for. You'll get credit toward more Patagonia gear, either used or new. As a logical extension of their environmental commitment, Patagonia encourages you to buy only what you need. Clothing can have a much longer life than what we sometimes think. Of course, the best option is to wear your own clothing items for as long as you can, to the point where resale isn't an option because it's so worn out. Source: “Patagonia launches Worn Wear, an online store for used gear,” by Katherine Maritinko. https://wornwear.patagonia.com. One of the planet’s central cities has gone fully on the attack against the fossil fuel industry, which means the tide is finally turning in the climate fight, according to Bill McKibbon at 350.org. On January 10th, New York Mayor Bill de Blasio made two major announcements: New York's pension funds will divest from the big oil and gas companies, and the city is suing the biggest of these corporations for the climate damage they've caused. This is a huge moment in the fight to stop climate change. A city as iconic as New York could trigger a wave of action against the fossil fuel industry from other powerful cities and states around the U.S. and globally. As one of the financial centers of the world, New York sends a powerful message about the fiscal folly of fossil fuels. Not only is New York City divesting, it is also taking those most responsible to court. Fossil fuel companies – and their lobbyists – are to blame for the climate crisis we're in and it's high time they're held to account. It also shows us what is possible when we step up and fight back. New Yorkers, still reeling from Superstorm Sandy, fought long and hard for this win. Now we need more people to take up this fight in their communities. There’s no excuse for any city or state, any province or region, any pension fund or portfolio, to be in business with this industry. There’s a new environmental danger that just may turn out to be the biggest environmental problem you’ve never heard of. New studies indicate that the fibers from synthetic clothing are poisoning our waterways and food chain on a massive scale. Microfibers—tiny threads shed from fabric—have been found in abundance on shorelines where waste water is released. Alarming numbers of these tiny fibers are making their way from your washing machine into aquatic animals. Health problems among plankton and other small organisms eat the plastic microfibers, which then make their way up the food chain, eventually reaching you and your family in the food you eat. Plastic microfibers are found in Spandex and fleece and outdoor apparel. They’re problematic because they do not biodegrade, and tend to bind with molecules of harmful chemical pollutants found in wastewater, such as pesticides or flame retardants. Plus, fibers from apparel are often coated with chemicals to achieve performance attributes such as water resistance. What is astounding is how many fibers are released with every wash. One study revealed that every city of 100,000 residents releases a wash-related volume of microfibers that’s equivalent to 15,000 plastic bags. That means that a city the size of Los Angeles is releasing enough microfibers to make more than half a million plastic bags daily. Patagonia (the outdoor and sports clothing company) is in the process of creating, manufacturing, and marketing a bag—called Guppy Friend—to contain microfiber clothing when it’s washed, so fibers don’t pollute water systems. Until washing machines and wastewater treatment facilities can be outfitted with proper filters, and shoppers are willing to transition to fewer synthetics in their wardrobe, Guppy Friend sounds like the best interim solution we’ve got. Clearly, the impact microfiber clothing has on the environment is something to consider when shopping for clothing. Your contribution to protect nature matters. German retailer Aldi is rebranding itself as a health-focused supermarket rivaling Whole Foods for the organic market. With low prices AND a focus on health, Aldi is gaining a reputation as the food conscious shoppers go-to store. In its quest for quality announced that as of January 1st, 2017, the eight last remaining pesticides from all products on its U.S. stores shelves have been removed. The grocery chain is also expanding its organic food brands, removing some artificial ingredients from products and adding more gluten-free items. Additionally, it has removed certified synthetic colors, partially hydrogenated oils, and MSG from its private-label products (which make up 90% of sales). Hope is a miraculous thing. With hope you can continue to thrive in the worst of circumstances. Like many of us, I’ve been feeling a bit hopeless lately. Our country is a mess. It looks like the environment may be a lost cause. Actually, there’s a lot of good change going on, lots to be hopeful for. For example, a recent MIT study predicted that 87% of vehicles on the road could be replaced by more sustainable cars in the near future. Such a proportion would lead to a 60% reduction in total U.S. gasoline consumption. City after city, from San Diego to Miami, is adopting laws to use less plastic and keep it from polluting ocean waters and threatening marine life—which is a big problem. So don’t give up hope. Work in your community or in your life to live more sustainably every day.